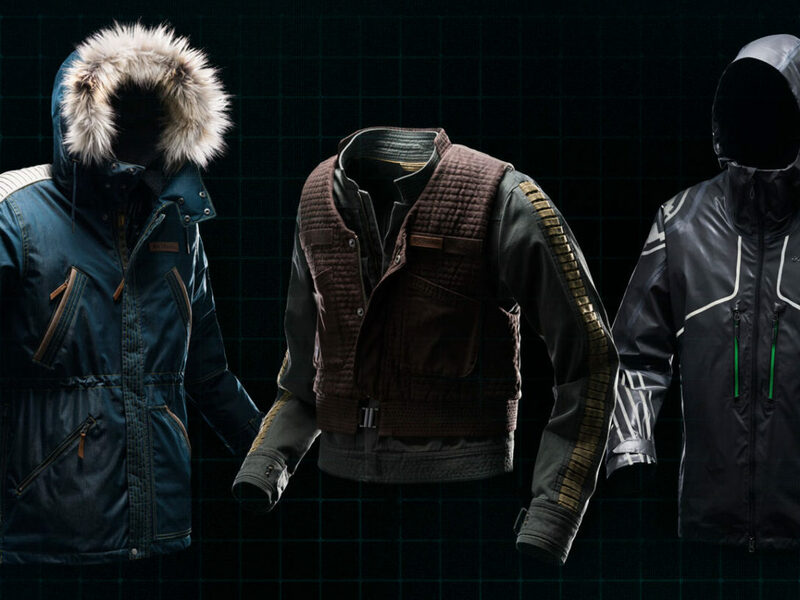 The voice of Ahsoka Tano and founder of Her Universe talks about where her company has been and where it's going, reveals new Rogue One apparel coming to Disney Parks, and much more. 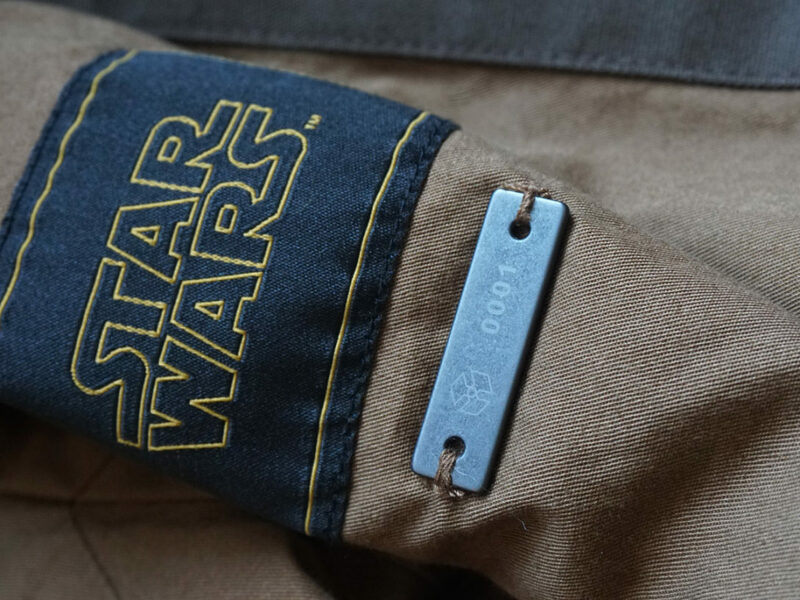 The story remains the same for many of us: growing up as a girl, options were pretty limited when it came to what kind of Star Wars-branded clothing we could buy. By the time many girls become teenagers, the square-cut hemlines of boys’ tees have long become a thing of the past when it comes to comfort and flexibility. So, for many ladies, the best solution for awhile was creativity — men’s Star Wars tees that had enough room to mess with, and a pair of fabric-cutting scissors. That is, until people like Ashley Eckstein decided one day to pick up their scissors and take one giant leap toward fashion-forward fandom. Six years ago, Eckstein (who is probably best known around these parts for voicing Ahsoka Tano) decided T-shirts — especially those cut from the cloth of the men’s section — were not enough. She kicked off Her Universe and threw open the doors of possibility with creative prints, dresses, cardigans, and accessories. Boldly and brightly, Her Universe demonstrated that not only could fandom-centric brands serve ladies and make money, but that there is a huge demand for something beyond your standard witty T-shirt. Fans want to be able to share their love in ways that fit their self-expression, and Her Universe was one of the first brands to truly provide that. Now, entire fashion lines are dedicated to creating high-quality, effortless looks for all fans, and Eckstein’s original idea has spawned into a full-fledged, successful company. Eckstein was fresh off of an audition when we spoke, managing a hectic schedule post-San Diego Comic-Con, where the latest Her Universe fashion show had just finished wowing a packed house. In this special interview for Fashion Week 2016, we spoke about where it all started, where the sky will take Eckstein from there, and what fans can expect from Her Universe at Disney Parks this fall. StarWars.com: To borrow an expression from Star Wars Rebels, what was the “spark” that ignited Her Universe? 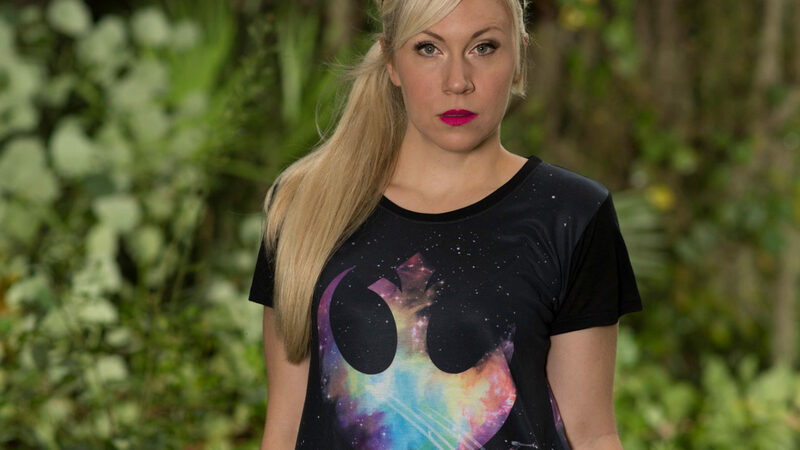 Ashley Eckstein: What really ignited it for me was when I was shopping for Star Wars clothes, and I came up empty-handed. It was about some time between 2008, 2009, and I was really starting to go out to promote The Clone Wars. So I was going to San Diego Comic-Con, and Disney’s Star Wars Weekends, and all of these events, but I only had one shirt to wear that was made for women. 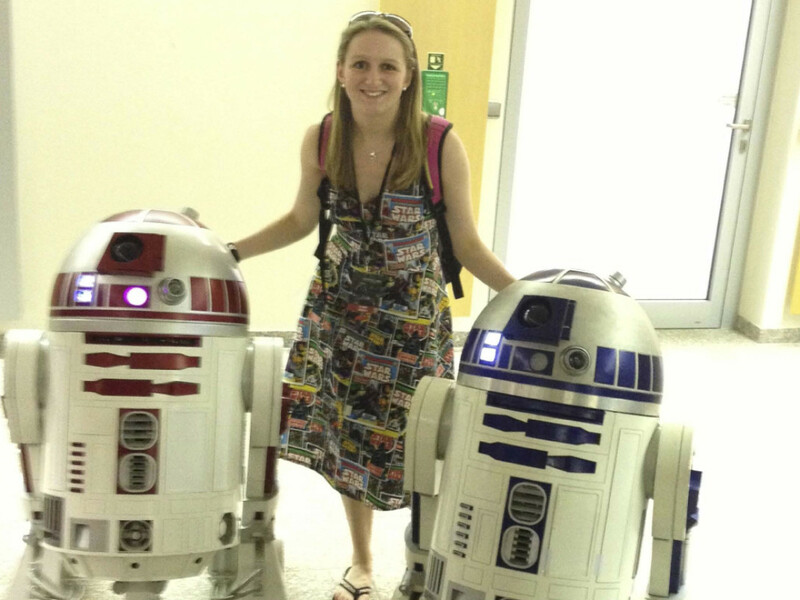 And my husband — I’m a much bigger Star Wars fan than him — but he had several Star Wars shirts! I never really paid attention and I thought there were Star Wars clothes for girls until I came up empty handed. There was literally nothing, and I was left shopping in the men’s and boy’s sections. So I started doing my research, because I thought, “This doesn’t add up,” and I found out that half of all sci-fi and fantasy fans are women. There’s so many girls, everywhere, that like Star Wars. Then I read story after story about women and girls who were bullied for liking Star Wars. That’s when message boards were really big and really popular. Blog post after blog post from women who said they had to pretend to be men on forums so that they could have a conversation about Star Wars and be taken seriously. And how much that hurt, how hard it was to be accepted as a girl. So I thought, someone’s gotta change this. We have to make this a more accepting environment for girls, because Star Wars is not just for men, it’s not just for women, it’s for everyone. So that was the spark that ignited Her Universe: coming up empty handed when I went shopping, and then I read stories of women being bullied and I thought, we’ve got to change the culture. StarWars.com: And so you have! Her Universe has produced some amazing Star Wars pieces from the beginning — what is it like designing and producing pieces for such a long-standing franchise? Ashley Eckstein: You know, it really is an honor. I feel very blessed, and lucky, and fortunate that I got to start with Star Wars. One of the biggest franchises, one of the biggest stories of all time… I started with Star Wars, so I guess you could say I’ve been spoiled by getting to start with such an iconic franchise. But that’s how I feel, in general, being associated with the brand. 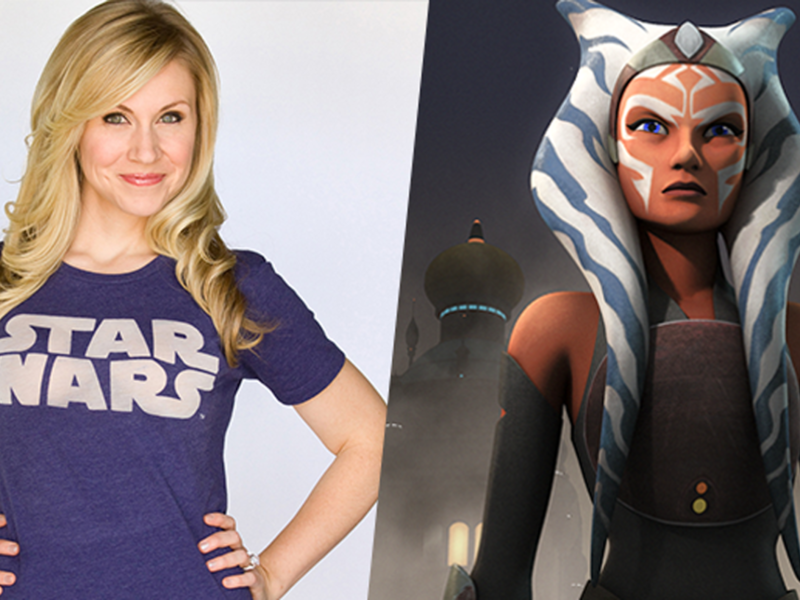 Being the voice of Ahsoka — when I was cast, I felt like I won the lottery, truly. It’s not something I took for granted, and I realized how fortunate I was to be chosen to be associated with Star Wars. I realized how important it is to fans around the world, and what an iconic character Ahsoka was. She really represented such change for female characters and for women. I wanted to do right by the franchise, by the films, by the fans, and by Ahsoka. I wanted the expectations and I wanted to be a good example for fans everywhere. Having the ability to be a Star Wars actress and a Star Wars designer is something I never ever take for granted. Every single day you kind of pinch yourself and think, I’m so lucky to be associated with this, and I want to do right by the franchise. 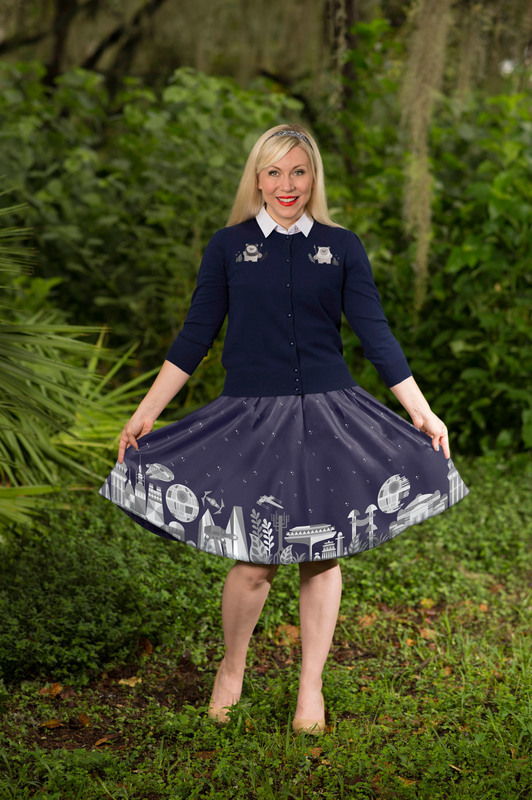 Star Wars style: Ashley Eckstein models Her Universe’s upcoming Disney Parks-exclusive Star Wars timeline skirt and Ewok cardigan. Photo by Preston Mack. Skirt saga: The full timeline skirt design. 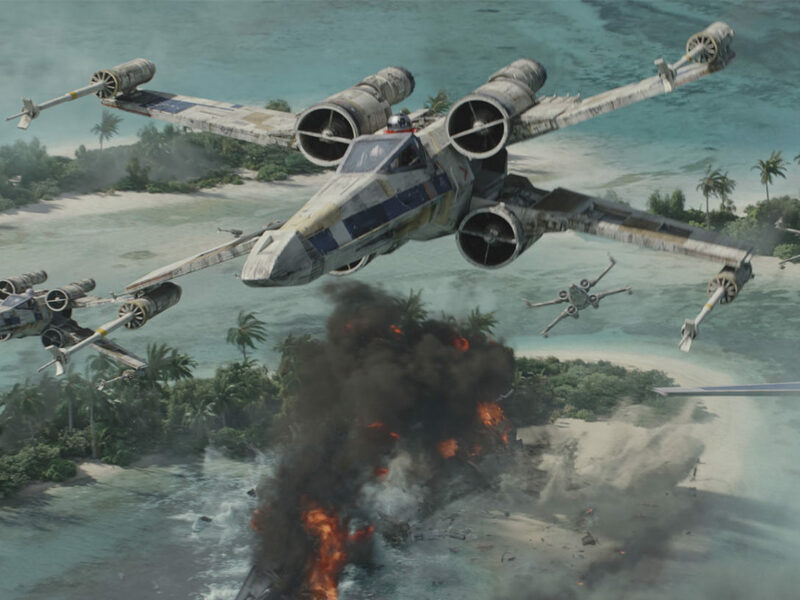 StarWars.com: Time for some exclusives! You’ve got a couple pieces coming to Disney Parks this season for Star Wars, and they are beautiful. We need to talk about the timeline skirt first, because it tells the story of the saga in such a cute, creative way. Where did this piece begin? 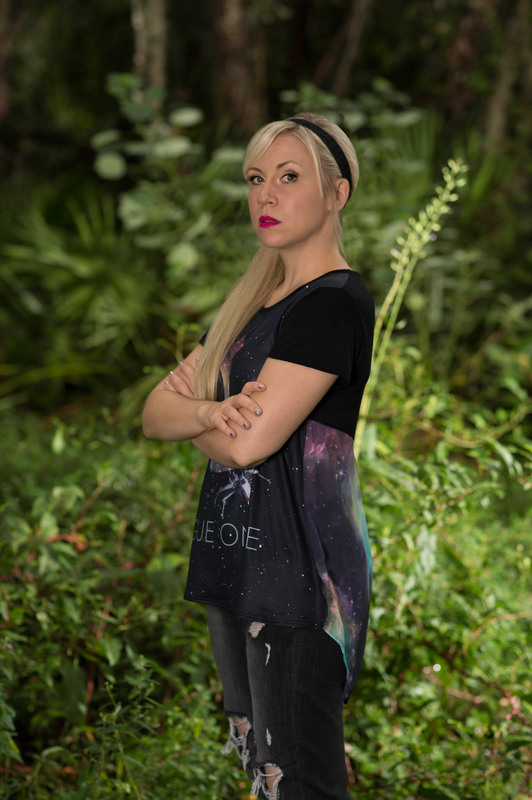 Ashley Eckstein: I’m excited that we had the chance to collaborate on this one with Ashley Taylor. She’s a rapidly up-and-coming artist, and she’s known because of her Disney art. So I’ve been following her on Instagram for a while and we have several mutual friends, but really, I’ve been a fan of her art for a long time. With the art that we do for Disney Parks, I try to do something for the Star Wars fans — something exclusive, special, and new. And I’ve always been a huge, huge, huge fan of [Walt Disney Company painter and illustrator] Mary Blair. I have her painting — not the original, of course [Laughs] — but I have a replica of her painting that was inspiration for It’s A Small World hanging in my living room. So when I was planning this with Ashley, I said, “Could you be inspired by this painting by Mary Blair?” And I suggested wrapping the Star Wars timeline around a skirt. I said, take all six movies — we designed this before The Force Awakens — and think, what would that look like? When Ashley came back, honestly, I was blown away. And I think it makes the perfect skirt. There’s also a matching cardigan with two little Ewoks! The thing with Disney Parks is that we’re starting to do so much fashion for them, and we’re really working to make it exclusive. When someone thinks about buying clothes at the parks, they’re thinking T-shirts and souvenirs. But that’s not the case, you can get super cute fashion; skirts, dresses, and fashion tops that you can’t get anywhere else. It’s really becoming a fashion destination at some of their boutique stores. She rebels: Eckstein in Her Universe’s upcoming Rogue One: A Star Wars Story dress (above) and top (below), also exclusive to Disney Parks. Photos by Preston Mack. 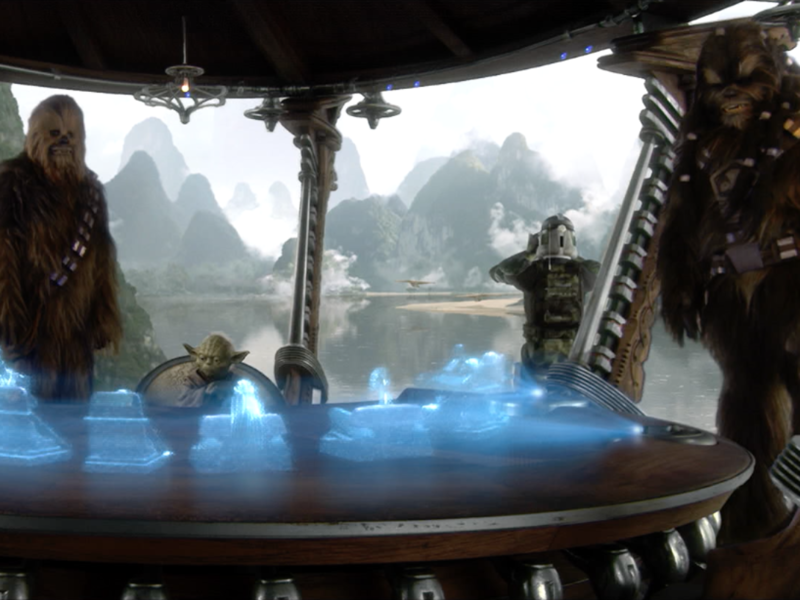 StarWars.com: There’s got to be something exciting to designing with a sense of mystery — is there anything else you’ve been working on in secret? 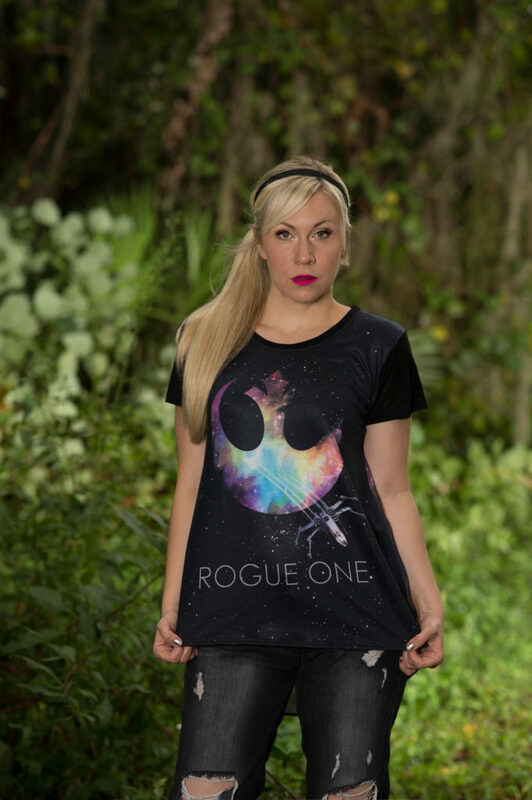 Ashley Eckstein: Right now we’re working on two brand new additions for Rogue One for our Disney Parks collection. One of them is a beautiful new dress, and there’s a fashion top as well. And I like that sense of mystery! Everything is awesome about this dress: Eckstein in the Ahsoka Tano LEGO dress at SDCC 2016. Photo by Debshots Photography. StarWars.com: Let’s rewind a bit to this summer, because we have to talk about your LEGO Ahsoka dress during the Her Universe fashion show at San Diego Comic-Con. It weighs 25 lbs. and is made up of 10,000 individual LEGO pieces. I know that it was a huge collaboration, so how did the dress come into being? So the two of them collaborated, and basically, Andrew made a black gown out of fabric. Then Nathan gave him 5,000 flat LEGO bricks. And so Andrew punched holes in all of them, and then sewed on and covered the entire dress with LEGO bricks. So we called it a “little block dress” instead of a little black dress. Then he gave it to Nathan, and Nathan covered it in another 5,000 LEGO bricks… It was two layers, so it was definitely heavy, but it was pretty comfortable! It wasn’t so bad. And you know, I knew exactly what I wanted. Dave Filoni had drawn me a sketch of Ahsoka, and so I called up Dave to ask for his blessing and I asked to use his sketch as inspiration for my gown. And he was very excited, gave me his blessing, and he just said — well, my sketches are in black and white, could you add color? Ahsoka’s colors are so iconic. And so Nathan brought it to life, he added all of the colors, and everyone just did such a beautiful job. StarWars.com: Talk about a collaboration! When you’re looking for artists and designers to work with like that, are there certain elements or personality traits that catch your attention? Ashley Eckstein: I mean, I became a fan of Ashley Taylor’s on her Instagram. I kind of just Instagram-stalked her, you know? 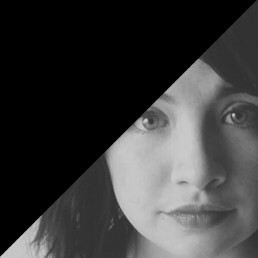 And so I became a fan and kind of just reached out to her out of the blue, and I asked her to collaborate. So usually it goes like that — I’m often inspired by their art, and I become a big fan, and eventually I find a way to collaborate with them. I’m excited to work with anyone — I encourage fans to approach me at cons with their art and talk about it. You know, one of our employees now approached me at San Diego Comic-Con and said, “I want to work with Her Universe, here’s my business card…” She said, “I’m a fangirl and I believe in the mission of Her Universe.” Now she’s an integral part of our team, and if she’d never done that, I never would have met her. You know, Her Universe to me is a real group effort, and I’ve said that from day one. As fangirls, we all want new and different, exciting things in fashion. With our community, this has been a major group effort. I can’t do this alone, and I will say, I couldn’t have done this without the support of our community and all of the fans. StarWars.com: Closing up, Her Universe offers a great variety of sizes and uses diverse models to show off the brand. We all come differently packaged, but at their core, what kind of traits and goals do you think the “Her Universe” fangirl has? Ashley Eckstein: You know, our logo design is what I think about immediately. To me, that’s actually Her Universe: It’s a big, purple planet that exists where a fangirl can step into the spotlight and be heard, be celebrated, and be supported. So that’s what I wanted Her Universe to be — a safe, empowering, and positive community. But as far as the fangirls go, our slogan is “Be Your World, Dream Your World, Flaunt Your World.” So what we encourage all fans, including fanboys, [is] to adapt these ideas. So “Dream Your World” is “What do you want to be?” So as kids, we want to be a Jedi, or a superhero, and it’s a dream. But as you grow up, you realize that there are really heroic and amazing things that we can do in real life. We can be a real-life Jedi and a real-life superhero, and so that is what I mean by “Be Your World.” Then, “Flaunt Your World” is being proud of who you are, and what you like, and what you do. Then, also, on the fashion side of it, it’s about looking the way you want. For so long, fangirls have been cast aside and put down for being women, and we encourage fangirls to embrace their fandom and who they are. So that’s what I think that means. Fans can head to Disney Parks this fall to pick up the all-new skirt and cardigan just in time for the season’s chilly weather. As for Eckstein, the sky is the limit: Her Universe opened a publishing branch this year and has new releases every season, so between that and her acting career, it doesn’t look like this multitalented powerhouse will be slowing her roll any time soon.